The Canteen Kopje (CK) skull was found by a diamond digger working the Vaal River gravels in 1929. It was hailed by Robert Broom as an exceptionally robust prehistoric individual that was ancestral to modern South African populations. Further exploration of the Vaal Gravels has confirmed the antiquity of the purported find locality, but the heavily restored CK cranium offers limited possibilities for morphometric re-examination or direct dating with which to test Broom's assertion. We used X-ray tomography to create a computerised 3D image that would provide optimal visualisation of the morphometry of the bony surfaces. The results showed that the CK cranium falls within the range of variation of Holocene Khoesan and lacks archaic features. 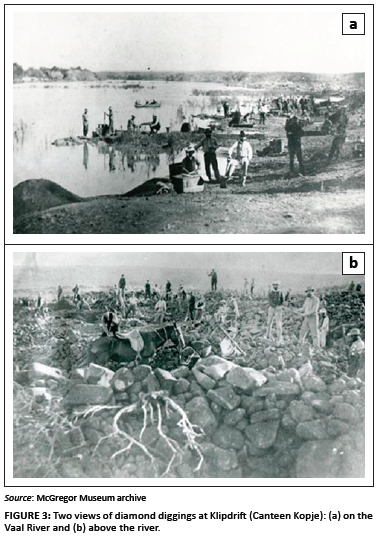 We propose that it was probably a Late Stone Age intrusion into the Vaal Gravels or the overlying Hutton Sands. A few months ago, the discovery of the Springbok skull revealed to us the fact that many thousands of years ago there lived in South Africa a large-brained powerfully built race which was neither Bushman nor Bantu, and a race which in all essentials resembles the living Korannas [a Khoe group, remnants of whom lived along the Vaal and Riet Rivers9,10] so closely as to leave little doubt that the Korannas are the descendants. Thus, the discovery in 1929 of human remains at the known Acheulean site of CK11 filled a vacant niche in an already well-constructed paradigm - one that influenced the thinking of physical anthropologists for many years. The CK remains, comprising fragments of a human cranium, were discovered by a diamond digger named Kenneth Kemp and passed to J.G. van Alphen, 'magistrate, writer and fossil collector'12, who presented them to the McGregor Museum. The museum made the remains available to Robert Broom for examination. Broom11 published the first description of the skull in Nature, describing it as a 'fossilised human braincase recovered from an alluvial deposit of the Vaal River at Canteen Kopje near Barkly West.' Curiously, he also refers to 'some fragments of limb bones' found with the skull, but did not describe them and they are not mentioned in the museum's 1929 accession record (MMK 215: 'Skull [incomplete]'). Broom11 described the CK specimen as one of the largest and most robust he had ever examined. Broom identified the specimen as ancestral to modern South Africans, probably more recent than the Tuinplaas or Boskop skulls. The CK specimen was one of a number of crania discovered in South Africa in the first part of the 20th century that were grouped together because of their large cranial capacity and presumed antiquity into the so called 'Boskop' physical type. These crania were found throughout South Africa, some apparently associated with Middle Stone Age artefacts or in 'pre-Bushman' archaeological horizons.18,19,20,21,22,23,24,25 Accordingly, the crania played an important role in early discussions of the origin of the southern African Khoesan.26,27,28,29,30,31,32,33 New developments in the field have enabled researchers to date some of these specimens and re-examine their association with a specific archaeological horizon. At the same time, the application of advanced imaging and statistical techniques have provided better resolution and analysis of the size and shape of incomplete specimens, thus enabling their integration into the current human evolutionary record. 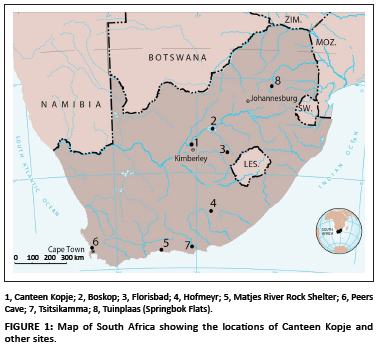 This reclassification has been carried out for skeletal remains from Tuinplaas,34 Matjes River Rock Shelter,35 Hofmeyr,36 Peers Cave37 and other localities.38 Ranging in age from the late Pleistocene to the post-contact period, these specimens provide a chronological framework with which to evaluate the CK skull and assess the probability that it derives from the Vaal Gravels. The CK cranium is incomplete. It comprises most of the occipital bone except for the basi-occiput, incomplete right and left temporal bones, part of the right mastoid process, most of the left parietal, but only fragments of the right parietal and left side of the frontal bone; about two-thirds of the lateral part of the supra-orbital margin and the orbital root of the zygomatic process are also present (Figure 4). The supra-orbital margin is broken inferiorly, which limits assessment of its size and shape. The left lateral portion of the frontal bone shows a pronounced, forward-projecting supra-orbital ridge, associated with a well-defined post-orbital sulcus. The supra-orbital ridge continues laterally as a pronounced supra-orbital shelf that forms the orbital root of the zygomatic process. The ascending portion of the lateral fragment of the frontal squama is low, but full and rounded. The superior temporal line is pronounced with a well-developed crest. The mastoid process is broad and is bounded medially by a deep digastric groove. Medial to this groove are two parallel, well-developed crests, with the medial one the most distinct. Broom modelled the missing parts of the cranium in plaster of Paris: the face, the orbits, the glabella, the vault and most of the right side of the frontal and parietal bones, and the sphenoid (Figure 4). The resulting reconstruction shows a very long and low calvarium with projecting supra-orbital ridges and a short, broad face. Based on this reconstruction, Broom11 estimated cranial length (glabella to lambda) as 215 mm, maximum cranial breadth as 140 mm and basi-bregmatic height as 140 mm. It should be emphasised that three of the four landmarks used (glabella, bregma and basion) were missing and arbitrarily defined by Broom. The occipital and parietal bones of CK are flattened superior-inferiorly, with lambda inferiorly located and there is a prominent occipital bun. How much of the flattening results from post-depositional compaction, and/or the reconstruction, is difficult to establish. Wells25 questioned the accuracy of the restoration, specifically the curvature of the parietal fragments and angulation of the occipital bone. He pointed out that the vault contour was somewhat lower and flatter in the restoration than in the original illustration given by Broom11, exaggerating the length of the skull. Even if the restoration exaggerated the length of the occipital chord, it would not have affected the length of the occipital arc, which is exceptionally long (measuring 120 mm from lambda to the most anterior portion of the incomplete basi-occiput). A feature of the CK skull, which has not been previously described, is a well-defined circular depression located on the left side, some 44 mm posterior to the rim of the orbit and directly above the superior temporal line (Figures 4a-b and 5a). This lesion is approximately 2 cm in diameter with smooth, inwardly sloping margins and slightly raised edges (Figure 5a). The bone surrounding the lesion shows no cracks or breaks that would indicate that damage occurred around the time of death or post-mortem. A depression of similar size and form is present on the frontal bone of at least one other cranium from the Northern Cape held in the McGregor collection - an adult female (catalogue number MMK 292) described in the McGregor museum's accessions catalogue as: 'Skull only, no lower jaw. Koffiefontein. 19/6/1946. [Presented by] W [illiam] Fowler'. It is one of about 57 burials excavated by Fowler in the environs of Koffiefontein that were attributed to the Late Stone Age Type-R stone-walled settlements along the Riet River.39,40,41 In specimen MMK 292, there are clear signs of reparative bone formation in the central part of the affected area confirming that the lesion occurred during life (Figure 5b). It may have resulted from trauma, pressure from a cystic lesion of the scalp or an incomplete scrape trephination, as described by Drennan42 on Khoesan crania. If we assume a similar aetiology for the lesion present on the CK skull, we may conclude that it too resulted from such a non-lethal event. 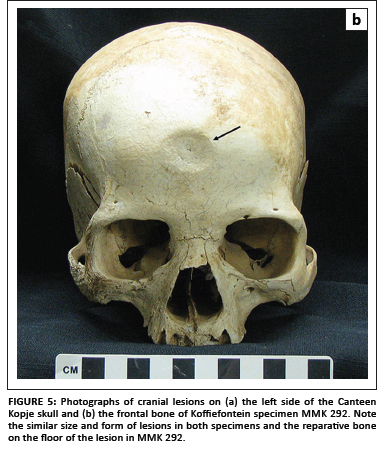 Broom's restoration of the CK cranium now shows many signs of wear and tear. The bones are coated with shellac that has discoloured with age and is chipped in places. The margins of the bones are deeply embedded in plaster, which obscures their edges, whilst the thick layer of shellac obscures the outer surface of the bones. A lateral skull X-ray radiograph was taken to evaluate the feasibility of freeing the bones from the plaster to facilitate a detailed study of its external and internal morphometry, as well as to check for matrix that could be used for dating or to establish provenance. The radiograph showed that the materials used by Broom in the skull reconstruction included a metal strut placed inside the cranial vault for support, whilst the bone fragments and joins were deeply embedded in the plaster, thus complicating any attempt to free them. As an alternative measure, a series of non-invasive investigations including X-ray computerised tomography (CT) scans was conducted to create a 3D computerised model of the skull that would differentiate between bone and plaster. The line profile graph shown in Figure 6 shows the peaks representing the three media - the void, the plaster and the bone. For the bone area, the voxels varied between 1000 and 18 000 in grey values; for the plaster area, the values varied between 800 and 1000; and for the transitional area between the void and the plaster, the values varied between 500 and 900. These results show that the pixel density provided good definition between the bone, the plaster and the metal strut, with the opacity of the bone nearly double that of the plaster matrix (Figures 6 and 7). 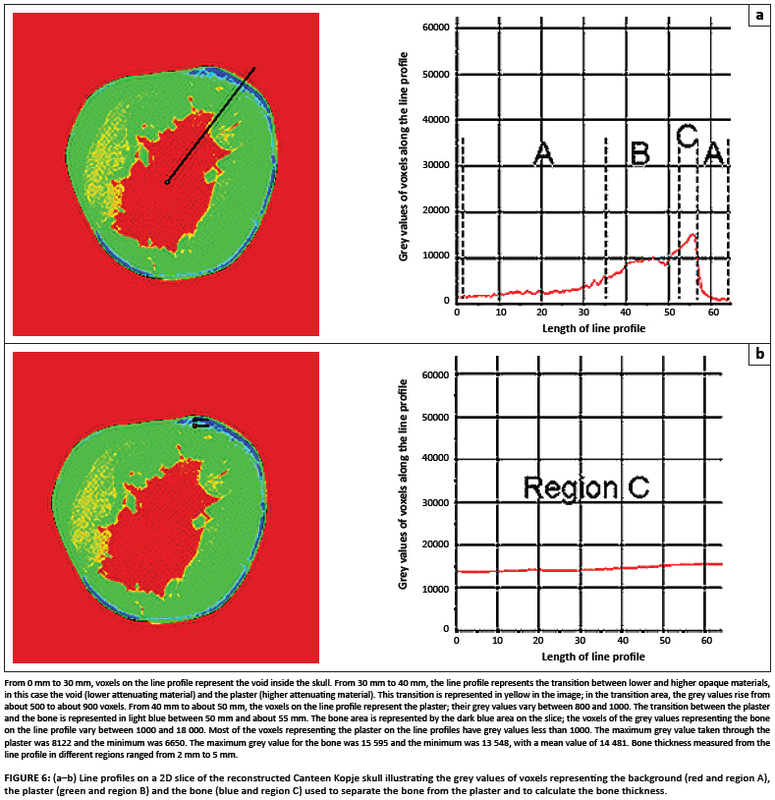 The wall thickness analysis menu, used to map the thickness of the cranial bones at different locations on surface images, is shown in Figure 7. The thickness of the bone at different locations varied between 2 mm and 5 mm. Selected 3D reconstructions of sagittal sections through the parietal and occipital bones are shown in Figure 8. Detailed examination of the supra-orbital region showed no evidence of frontal sinus extension into the preserved portion of this bone, as would be expected if the supra-orbital region was especially thick. 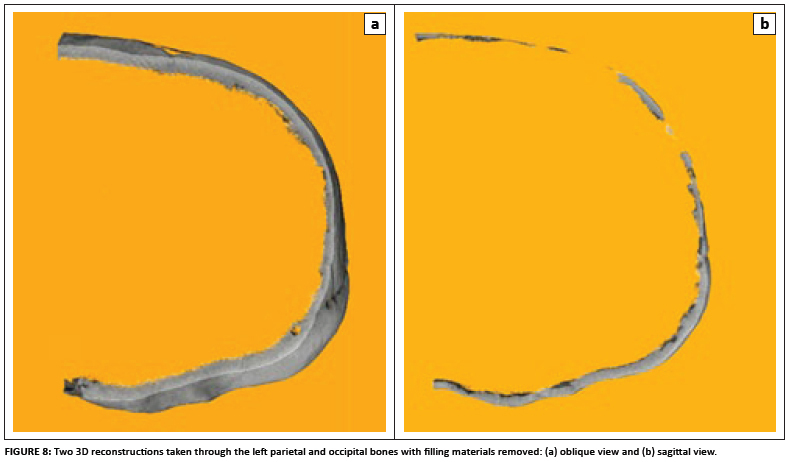 No evidence was found for sclerotic bone or bone resorption on the margins, on the surface of the parietal lesion or in the surrounding bone, nor was there any evidence of damage that might have been caused post-mortem. The sliced tomogram showing the interior of the posterior half of the skull, primarily represented by the occipital bone, is shown in Figure 9. The endocranial surface is obscured in places, probably by materials used in reconstruction (perhaps hessian impregnated with plaster or glue), but there is no evidence of adherent sedimentary matrix that could be used for dating or to assess provenance. The X-ray CT scans confirmed that, during reconstruction of the CK skull by Broom, the bones were inserted directly into the plaster so that any attempt to separate them without causing further damage would be risky. The scans also showed that there does not seem to be any matrix adherent to the inner surface of the bones that could be used for dating or determining the stratum in which they were found. Singer30 reported that all the morphological features previously described as 'Boskopoid' or 'Australoid' were present in recent Khoesan populations and wrote a scathing denunciation of the use of type specimens for defining distinct racial types. Singer's contention has been supported by more recent studies, such as Morris41 and Stynder et al.38, which have demonstrated that the 'Boskopoid' specimens fall within the range of morphometric variation of recent Khoesan, when this definition is expanded to include specimens defined as 'Hottentot' or 'Korana' that were excluded from many analyses of indigenous South African populations defined as 'San' (see for example Howells49). Renewed excavations, with more precise stratigraphic control, at sites such as Matjes River Rock Shelter50 showed that the alleged association of 'Boskop type' specimens with Middle Stone Age artefacts51 was erroneous and that the concept of an ancestral 'Boskop type' needed to be re-evaluated.27,28,29 Indeed, many of the 'Boskop type' specimens are now known to be more recent than originally thought. 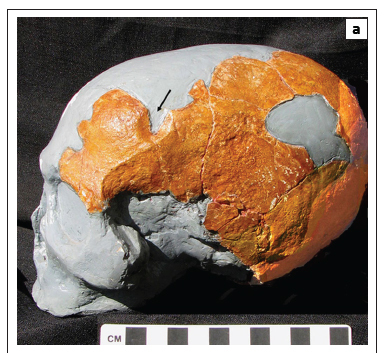 For example, the Tuinplaas skull has now been dated to between 20 000-11 000 BP,34 the Matjes River Rock Shelter skeleton No 1 to 2280±60 BP,35 the Peers Cave specimen (SAM-AP4692) to the mid-Holocene38 and the Cape Flats specimen has been dated by association to 150±50 BP.52 Noteworthy is the fact that the latter specimen was considered by Broom to most closely resemble the CK skull. 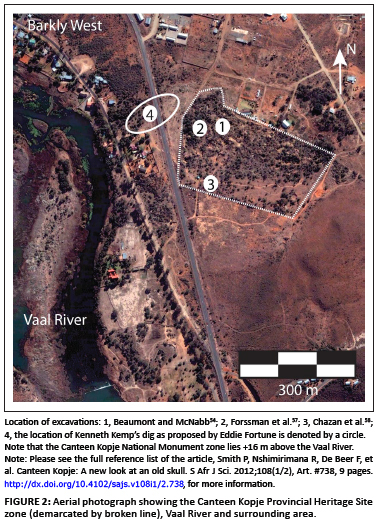 Following recent excavations at Canteen Kopje within the Provincial Heritage Site zone (Figure 8), Beaumont and McNabb15,16,53,54 identified three main archaeological horizons. Acheulean artefacts occur in the diamond-bearing colluvial sediments, the Younger Gravels (Rietputs A and B), which they termed Stratum 2 (a and b), and which include Victoria West cores and some of the largest handaxes ever discovered in South Africa.15,54,55,56 At the top of Stratum 2a, a small lithic assemblage that includes blades, laminar Levallois products, convergent points, retouched points and manuports has been attributed to the Fauresmith (a transitional Early to Middle Stone Age industry).16,53 The gravels are overlain by 0.2 m - 5.0 m of reddish sand known as the Hutton Sands (Stratum 1).3 The presence of Later Stone Age artefacts on the surface and in the uppermost layer of the sands, with Middle Stone Age artefacts deeper within them, have now been reported from three different excavation areas at the site (Figure 2).16,53,54,57,58 Although extremely rich in lithics, no faunal or human remains have been recovered from the Younger Gravels at the main CK locality, despite archaeological excavations at different localities within the site. the 'divine method' of analysis ... i.e. using very few facts, inadequate data, lots of gut reaction and an overflow of subjective opinions to make a pronouncement on the origin (ethnic, racial or species) of a skull (or even a tooth). Although the 'Boskop' theory has been discredited and laid to rest in most scientific circles,29,31,32,33,52 it is suggested that the CK restoration made by Robert Broom should be preserved as part of the historical record of Canteen Kopje. We would like to thank Peter Beaumont for bringing the CK skull to our attention and for comments on an earlier draft of this manuscript; Colin Fortune, Director of the McGregor Museum (Kimberley), for facilitating access to the CK specimen and for permission to use archived photographs of Canteen Kopje and the vicinity; Dr L. von Bezing of Kimberley, who undertook the initial X-ray radiographic examination of the CK skull; and Prof. T. Huffman for his hospitality and insightful comments. Funding to undertake this project was provided by a Canadian Social Sciences and Humanities Research Council grant to M.C. and a Hebrew University research grant to P.S. P.S., L.J. and F.D. were responsible for the experimental design. R.N. performed the 3D analyses. L.K.H., D.M. and M.C. made conceptual contributions. P.S. wrote the manuscript with contributions from the other authors.